If anything the action of this novel reminds me of Ray Bradbury's Illustrated Man just as the invasion of Opar brings strong recollections of the last story of Bradbury's Martian Chronicles. In the latter all the great fictions of mankind, fairies, ogres and whatnot have been driven from earth taking refuge on Mars. But as the true condition of Mars becomes known their world crumbles and disappears as there is no place in the universe left for them. That fate will never overtake Tarzan as he represents very real hopes, dreams and desires of mankind. 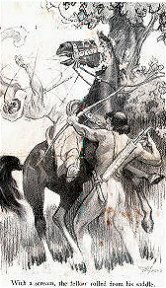 Even as the old world and old heaven of the Piscean Age begins to heave and crack as the new Age of Aquarius struggles to come into existence, the archetype of the Age is forming around Tarzan. Tarzan will emerge triumphant. The next two scenes of Burroughs' tapestry which come to life not unlike the pictures on the tattooed man are as vivid as any scenes Burroughs wrote. The agony of Gunner Patrick when he awakes to find himself alone is palpable. There is even an element of tragedy in his situation if one has sympathy for murderous criminals. Burroughs rather sneers that without his machine gun Patrick is rather a pathetic figure. But, while the machine gun represents advanced technology man's prowess has always depended on his weapons whether they be stones, spears and bows and arrows, an old harquebus or the machine gun or stealth bombers and self-guided blockbusters. The fellow with the latest model is always top gun on the block. Without his weapon he is naturally nothing. Even Tarzan would have been a dead man long before this without his father's knife. What makes Gunner Patrick so reprehensible is that he uses his weapon for injustice rather than justice. Thus without his weapon he is subject to the same injustice he would inflict on others. Still, he's our criminal so we have to take his side. One would say he is less criminal than the men who stole Jezebel from him except that out there they live by a different lawless code. As Patrick would say: They ain't no cops out there. Law is a matter of the strongest; so Tarzan as the strongest and justest will reestablish Law and Order. He acts as the judge and jury which some people with an opposing notion of Law might find offensive or even dangerous to their plans. How much of a coincidence then is it that in Tarzan's New York Adventure he is stripped of his status as lawgiver and subsumed to a different legal code? No coincidence at all to my mind. The legal decision declaring Tarzan a criminal also showed who was strongest in Hollywood. In fact, in late 1941 and into '42 Burroughs had been ousted from Hollywood himself, living in exile in Hawaii. The Golden Girl, Jezebel, had been taken into custody by Capietro but Stabutch also had eyes for her. The two men decide to play poker for her, best three out of five. Strange that an Italian and a Russian should be familiar with this quintessential American card game, but there you have it, they were. Stabutch loses but calls Capietro a cheat. This scene recalls ERB's own loss when he and Emma were in transit to Parma, Idaho. While Emma waited upstairs ERB got cleaned of the couple's last forty dollars in what may very well have been a crooked game. I haven't played poker a lot but I've never been in a straight game, so as a stranger, the odds are Burroughs' game was crooked. He doesn't say so, of course, but I'd be willing to bet he thought so. The memory was a horrendous one for ERB; it crops up occasionally in the corpus. My memory of a Navy game is always with me. In fact, someone I hadn't seen for forty years brought it up the first thing. These things are like the scar on Tarzan's forehead. Capietro and Stabutch fight, one out of one, that Stabutch wins. He then flees with Jezebel. The Gunner who has been gathering his wits above the scene sees the two ride out the gate. He follows in hot pursuit on foot. Stabutch and Jezebel put up for the night during which a lion scares their horses away. Hungry the next day, Stabutch stashes the Golden Girl in a tree while he goes hunting. Staking out a water hole he is surprised to see Tarzan drinking.  A golden opportunity to accomplish his mission but the strain is too much for his nerves; he misses his shot. 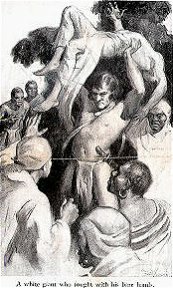 Running as fast as he can, Tarzan following, torments his victim with a couple of arrows before, as Stabutch begs for his life, putting an arrow through his throat. His throat! I interpolated his 'black heart' but was surprised by 'his throat.' As a probable surrogate for Stalin who sent him, why his throat? At any rate Tarzan has now completely defeated the Communists; once in Invincible and again here. Patrick has been miraculously reunited with Jezebel, but now all three are captured by the shiftas. The outcome is clear. 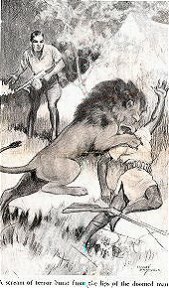 The faithful Waziri stage a frontal attack on the shifta stockade. Patrick and Jezebel, who have been bound and left in the same tent, free themselves. The hard thing Patrick has been lying on turns out to be his 'better half', the machine gun. He then opens up on the shiftas from the rear. No contest. The final picture in the web then, is the successful bringing together of all the threads and strands which began two thousand years previously in an entirely unrelated event, when Paul was matyred in Rome and Angustus fled for the African hinterland, bringing his slave girl with him. Lord Passmore as it turns out is Tarzan. He assumed the identity so as not to arouse suspicion. Hardly seems necessary for the Big Bwana but as ERB needed the faithful Waziri for the big battle scene finale, perhaps so. Tarzan at this point seems to be a solo act; there is no hint of Jane awaiting him back in Kenya. Lafe Smith and Lady Barbara are brought together. Thus the bright alter ego of Burroughs is paired up with a member of the English aristocracy, perhaps a match he would have liked in real life. Already three or four years into his affair with Florence, of which surely Emma was aware, one wonders what she thought when she realized she had been written out of the story. Well, she did turn to drink. More interestingly, Burroughs' dark alter ego, Danny 'Gunner' Patrick and the Golden Girl, Jezebel, are brought together. He is going to leave Chicago taking Jezebel to somewhere in LA to buy a service station. A worthy ambition; for some reason the movie, The Postman Always Rings Twice, pops into my mind. The screenplay for that movie was written by Raymond Chandler who, for no explicable reason, I associate with Burroughs. There must be some similarity between Philip Marlowe and Tarzan. Marlowe did get sapped a lot. Chandler even turns sapping into an art form. In pairing Jezebel/Florence off with his dark side ERB may be hinting at the direction his relationship with Florence will take. His life with her was certainly different than his life with Emma as he let his hair down and began dressing like quite the Dandy. On that score, in this novel, Burroughs selects his dark side to take the obligatory bashing. One wonders then if he attributes this dark side to the bashing in Toronto. Is he saying that this dark side was the result of being sapped? Is he saying that this Hydelike figure came into existence as a result of the bashing? Did he begin living a sort of double life some few years after he was laid out? Was his character even more erratic than it appears? How much did Emma put up with? His emphasis on the notion that every man has two characters that may diverge as did Jekyll and Hyde give reason to think so. At any rate the following couple years ERB himself would be leading a double life. As Lafe Smith with Lady Barbara/Emma and as the desperado Danny 'Gunner' Patrick with his amour Jezebel/Florence Dearholt. Jezebel is certainly appropriately named. The next two novels explain his own relationship to Florence and Emma. Leopard Men, which I have already reviewed, deals with his opting for Florence while City Of Gold deals with his rejection of Emma. But first some conclusions and organization.